This video was created with ArcGIS Pro 2.3. In ArcGIS Pro, you typically work in a project that is saved on your computer. However, you don't always need to save a project. Sometimes your tasks involve data preparation and management, and you don't need to make maps or solve analysis problems. In these situations, you can start ArcGIS Pro without creating a project. You can then process your data and close the application without saving a project. 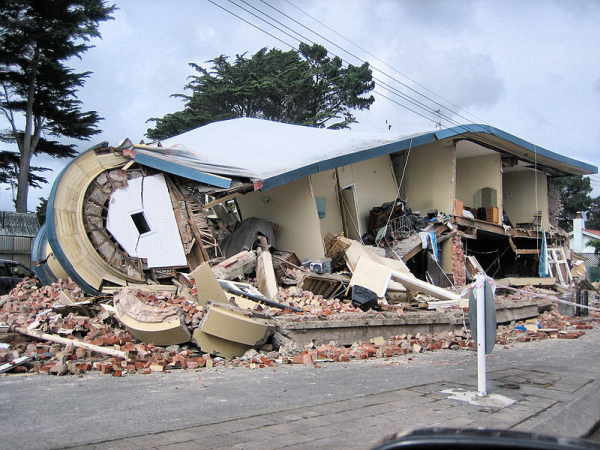 The magnitude 6.2 earthquake that struck Christchurch, New Zealand, on February 22, 2011, killed 185 people and caused massive property damage. In some badly damaged parts of the city, rebuilding houses and infrastructure was not a realistic option. A building in the New Brighton neighborhood of Christchurch following the February 22, 2011, earthquake. Photograph by Martin Luff. Downloaded from Wikimedia Commons and used under the Creative Commons 2.0 license. In one such area, the Otakaro Avon River Corridor, a plan was developed to create a so-called green spine of walkways, biking trails, and wetlands leading from the Avon River to the sea. Elsewhere in the city and surrounding area, many biodiversity and restoration projects are being carried out. 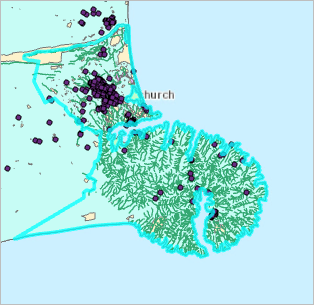 In this tutorial, you'll download data relevant to restoration projects in and around Christchurch. The data comes from different sources, has different spatial extents, has different coordinate systems, and is in different file formats. Your goal is to preview the data, process it for consistency, and organize it in a new file geodatabase. This geodatabase can be a common spatial data resource for GIS professionals working on restoration projects in the area. 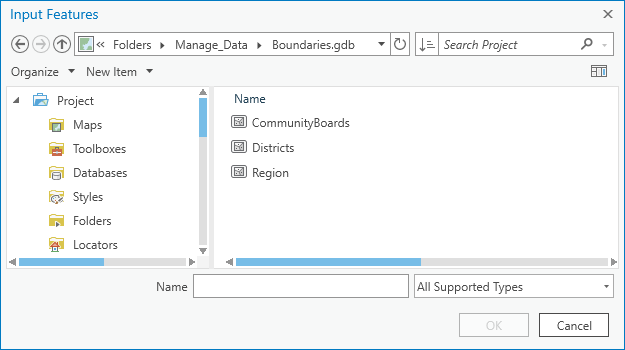 Go to the Manage data overview page on ArcGIS Online. Click Download on the right side of the page. In the Downloads folder on your computer, right-click Manage_data.zip and extract it to a convenient location, such as C:\Temp. This tutorial is a learning exercise. However, the earthquake restoration projects in and around Christchurch—including the green spine plans for the Otakaro Avon River Corridor Regeneration Area—are real and ongoing. For more information, see the Regenerate Christchurch website. Information about the 2011 earthquake is available from many sources, including the Wikipedia 2011 Christchurch earthquake article. When you start ArcGIS Pro without a template, you are not prompted to create a project. You do have the option to save your work as a project at any time during your ArcGIS Pro session. This tutorial assumes that you are using some default application settings. You'll check these settings and change them if necessary. On the settings page, in the menu on the left, click Options. On the Options dialog box, under Application, click General. Under Set general options for ArcGIS Pro, expand Start ArcGIS Pro. If necessary, click Show the start page. Expand Create projects. Under Geodatabase, if necessary, click New default geodatabase for each project. On the Options dialog box menu, under Application, click Metadata. If necessary, set the Metadata style to Item Description. 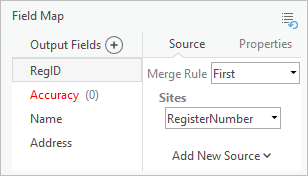 If you changed either the start page setting or the default geodatabase setting, exit and restart ArcGIS Pro. Otherwise, click the Back button in the upper left corner of the settings page. If you already have an ArcGIS Pro project open, you need to start a new project. On the settings page, click New on the left. Under Project Templates, in the list of blank templates, click Start without a template (you can save it later). Go to the next section of the tutorial. On the start page, under New, in the list of blank templates, click Start without a template (you can save it later). The application opens with no open views. You'll open the catalog view, make a folder connection to the tutorial data, and browse the data. On the ribbon, click the View tab. In the Windows group, click Reset Panes and click Reset Panes for Geoprocessing. This ensures that the Contents, Catalog, and Geoprocessing panes are open and that other panes are closed. On the View tab, in the Windows group, click Catalog View . The catalog view opens. On the ribbon, the Catalog tab appears. The Contents pane updates to show the contents of the catalog. The catalog view and the Catalog pane provide complementary ways to manage data. They have some functionality in common, but certain tasks, such as previewing data, can only be done in the catalog view. In this tutorial, you'll work with both the view and the pane. You'll also interact with the catalog through the Contents pane, which shows the contents of the active view, whether it's a map, a layout, or the catalog. Make the Catalog pane active and confirm that the Project tab is selected. Expand the Databases and Folders items. 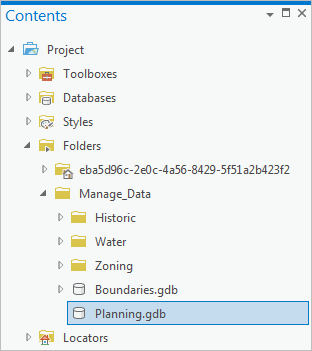 When you start ArcGIS Pro without a template, a default geodatabase and home folder are created in a temporary directory in your user profile. You'll change these defaults later. To access the tutorial data, you need to make a folder connection to it. Make the catalog view active by clicking its view tab. If the items in the catalog view are formatted as tiles rather than as a list, click the Column button in the lower right corner of the catalog view. On the ribbon, the Catalog tab is selected. In the Create group, click Add and click Add Folder Connection . In the Add Folder Connection browser, browse to the location where you extracted the tutorial data (for example, C:\Temp). Click the Manage_Data folder to select it. In the Catalog pane, the new folder connection appears under Folders. In the Catalog pane, expand the Manage_Data folder. It contains three more folders, two geodatabases, and a shapefile. Expand all the folders and geodatabases and their contents. The folders contain shapefiles and an Excel file. Each geodatabase contains two or three feature classes. Most of this data is relevant to Christchurch restoration projects. You'll examine the datasets to learn more about them. You'll work in the catalog view and in the Contents pane. 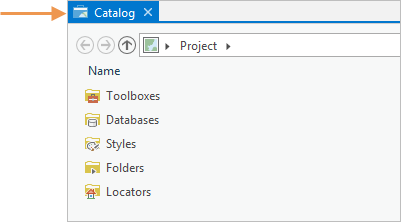 In the Contents pane (not the Catalog pane), under Project, expand Folders. Expand the Manage_Data folder and click Planning.gdb. The catalog view shows the two feature classes in the geodatabase: AvonRiver and PlanArea. In the catalog view, click PlanArea. The details panel displays Metadata, Geography, and Table tabs for the selected feature class. If the details panel isn't showing, click the View tab on the ribbon. In the Options group, check the Show Details Panel box. You can adjust the appearance of the catalog view by moving the vertical separator between the list of items and the details panel. In the details panel, click the Metadata tab if necessary. Review the PlanArea item description. In the details panel, click the Geography tab. The spatial data is displayed on a light gray basemap. This is the area designated in the Otakaro Avon River Corridor Regeneration Plan to be a green spine of walkways, bike paths, wetlands, and community spaces. Click the Table tab and preview the attributes of the feature class. The table has one record with name and area attributes. To be familiar with the data, you should also know its coordinate system. In the catalog view, right-click the PlanArea feature class and click Properties . On the Feature Class Properties dialog box, on the Source tab, scroll down and expand Spatial Reference. The projected coordinate system is WGS 1984 Web Mercator Auxiliary Sphere. In the Contents pane, click the Boundaries geodatabase. In the catalog view, click CommunityBoards. Preview the metadata, geography, and table of this feature class. 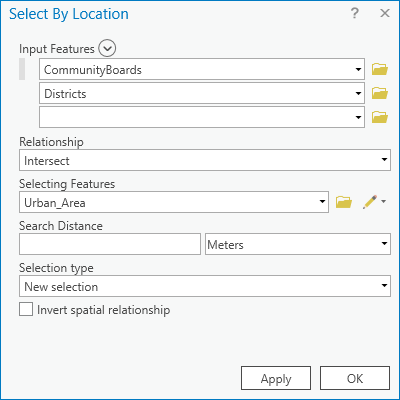 Open the CommunityBoards feature class properties and check its spatial reference. The projected coordinate system of this feature class is NZGD 2000 New Zealand Transverse Mercator. This is different from the coordinate system of the PlanArea feature class. Because New Zealand Transverse Mercator is a standard for New Zealand maps and data, one of your goals is to project all the datasets into this system. Optionally, preview some of the other datasets in the Manage_Data folder. You'll add the datasets to a map to explore them further. You'll do this from the Catalog pane. 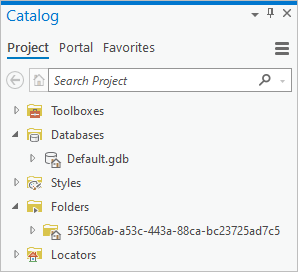 In the Catalog pane, make sure the contents of the Manage_Data folder are still expanded. Press the Ctrl key and click the following datasets to select them. Don't select the Excel file, the text file, or the Parks shapefile. Right-click any of the selected datasets, point to Add to New , and click Map . A map view called Map1 opens. The Contents pane displays the map layers. In the Catalog pane, click Parks.shp to select it. Drag it onto the map. Your layers will be symbolized in different colors. They may also draw in a slightly different order. In the Contents pane, click the PlanArea layer to select it. Right-click the layer and click Zoom To Layer . 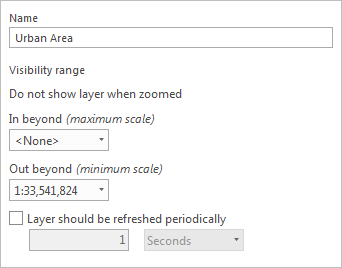 If you don't see the PlanArea layer on the map, you may need to move it above the other polygon layers in the Contents pane. To move a layer, select it in the Contents pane and drag it up or down to the position you want. As you drag the layer, its position is indicated by a thin horizontal line. Optionally move the boundary layers (Districts, CommunityBoards, and Region) to the bottom of the Contents pane, just above the Topographic basemap layer, so that they don't obscure features in other layers. In the Contents pane, click the Region layer to select it. Right-click the layer and click Zoom To Layer . Much of your data extends well beyond Christchurch. To create a compact dataset focused on the area of interest, you'll clip the datasets to a smaller extent. This means you need to find a layer, or a feature in a layer, that has the desired extent. You'll look first at the Districts layer. In the Contents pane, click the Districts layer. Right-click the selected layer and click Attribute Table . In the table view, find the row with the value Christchurch City in the TA2015_NAME field. Click the gray square at the left edge of the row to select the record. The corresponding feature is selected on the map. In the row of tools at the top of the table, click Zoom To . The Christchurch City district is a small area but still larger than you need. 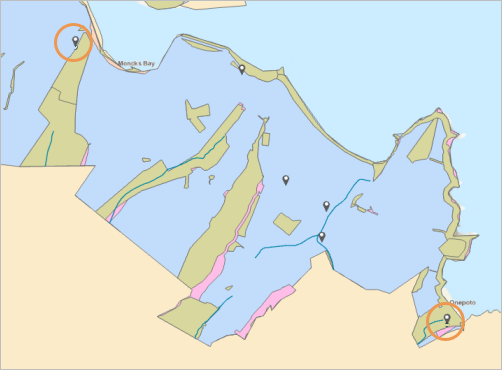 It includes Banks Peninsula, a circular outcropping that is not part of the urban area. In the row of tools at the top of the table, click Clear . You could explore other layers for a feature to represent your area of interest, but instead you'll search the ArcGIS Living Atlas of the World. The ArcGIS Living Atlas of the World is a collection of authoritative geographic information curated by Esri. To access the Living Atlas, you must be signed in to ArcGIS Pro through an ArcGIS Online portal. The name of your portal appears in the upper right corner of the ArcGIS Pro window. If you are signed in through an ArcGIS Enterprise portal, you can access the Living Atlas only if your administrator has enabled access. For more information, see Manage portal connections from ArcGIS Pro in the ArcGIS Pro help and Configure Living Atlas content in the ArcGIS Enterprise help. Make the catalog view active. The Contents pane updates to reflect the catalog. In the Contents pane, under Portal , click Living Atlas . You'll filter the Living Atlas content to display boundary features in New Zealand. At the top of the catalog view, next to the search box, click the Categories drop-down arrow. Expand Boundaries and click Administrative. In the catalog view, the Living Atlas content is filtered to the selected category. In the catalog view search box, type New Zealand and press Enter. The list is further filtered to administrative boundary data for New Zealand. In the upper right corner of the catalog view, click the Show/Hide Details Panel button . This gives you more room to see the layer names. In the lower right corner of the catalog view, click the Tiles button . The items display as tiles with thumbnail images. 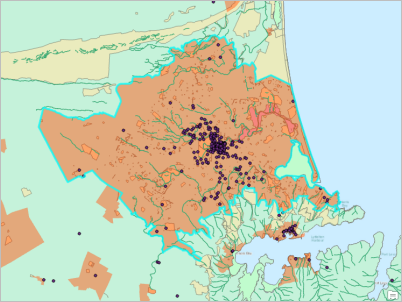 Locate the NZ Urban Rural Indicator boundaries 2018 - generalised feature layer. Click the layer to select it. Right-click the layer and click Add To Map1 . Make the map view active. Zoom in on the urban area of Christchurch, the large orange patch in the center of the view. 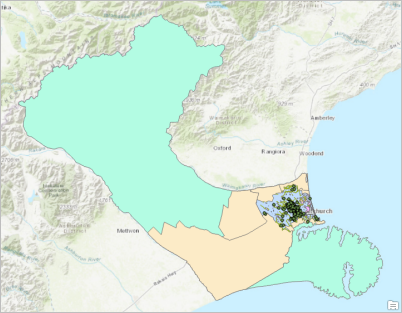 In the Contents pane, confirm that the NZ Urban Rural Indicator boundaries 2018 - generalised layer is selected. On the ribbon, click the Map tab if necessary. In the Navigate group, click the Explore tool drop-down arrow and click Selected in Contents. When you click a map feature, the Pop-up pane will show information for the layer, or layers, selected in the Contents pane. On the map, click the Christchurch urban area. The feature flashes on the map. The Pop-up pane confirms that the feature represents the major urban area of Christchurch. You'll use this feature to define your clip extent. You'll work with this layer throughout the tutorial, so you'll give it a shorter name. In the Contents pane, right-click the NZ Urban Rural Indicator boundaries 2018 - generalised layer and click Properties . On the Layer Properties dialog box, on the General tab, replace the current name with Urban Area. The layer is renamed in the Contents pane. You'll create a geodatabase and put it in a new folder in the same location as the tutorial data. You want to save geoprocessing outputs to this geodatabase, so you'll make it the default geodatabase. You'll also make the new folder the home folder so that other files you create are saved to this folder by default. Finally, you'll add the new folder to your list of favorites. Items that are favorites are readily available in any ArcGIS Pro project or session. If you need to access the folder in a future session, you can add it to your project quickly. In the Contents pane, under Project, click Databases to select it. Right-click the selected item and click New File Geodatabase . On the New File Geodatabase browser, browse to the folder where you extracted the tutorial data (for example, C:\Temp). Double-click the folder to open it. The Manage_Data folder is listed. In the New File Geodatabase browser, click the New Item drop-down arrow and click New Folder. The new folder is created. Its default name is editable. Rename the folder ChristchurchRenewal and press Enter. The new folder is selected. Click Open to open the ChristchurchRenewal folder (which is empty). In the Name text box, type ChristchurchData as the name of your new geodatabase. Click Save. The new geodatabase is created and displayed in the catalog view next to the default geodatabase that was created when you started ArcGIS Pro. In the catalog view, click ChristchurchData.gdb to select it. On the ribbon, under Manage, click the contextual Databases tab. In the Project group, click Make Default . 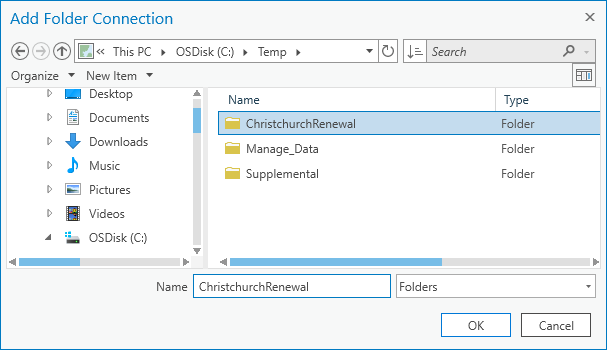 Now you'll add a folder connection to the ChristchurchRenewal folder so that you can access it quickly. In the Contents pane, under Project, click Folders. Right-click the selected item and click Add Folder Connection . Earlier, you added a folder connection from the ribbon. You can also add connections from the Contents pane or the Catalog pane. In the Add Folder Connection browser, browse to the folder where you extracted the tutorial data (for example, C:\Temp). Click the ChristchurchRenewal folder to select it. The new folder connection appears in the catalog view. You'll change the home folder in the same way that you changed the default geodatabase. The home folder is where output files that are not saved to a geodatabase (for example, layer files or shapefiles) are saved by default. In the catalog view, click the ChristchurchRenewal folder connection to select it. On the ribbon, under Manage, click the contextual Folders tab. In the Project group, click Make Default . In the catalog view, the ChristchurchRenewal folder is designated as the home folder. On the ribbon, on the Folders tab, in the Organize group, click Add To Favorites . At the bottom of the Contents pane, expand Favorites to see the folder. 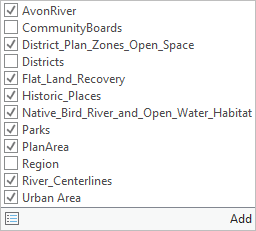 In any ArcGIS Pro project, this folder connection is now readily available. When the catalog view is active, browse to Favorites in the Contents pane, right-click the folder, and click Add To Project . You can also access favorites on the Favorites tab of the Catalog pane. You can right-click a favorite and click Add To New Projects. In that case, the item will be added to all new ArcGIS Pro projects automatically. To remove a favorite, right-click it and click Remove . 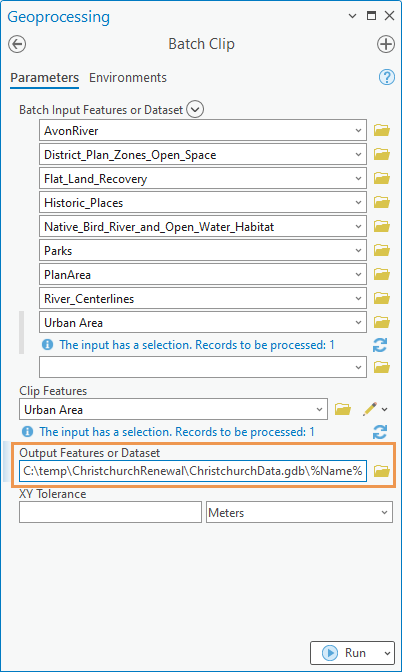 You'll clip most of the data in the Manage_Data folder to the Christchurch urban area, using the Clip geoprocessing tool. You'll run the tool as a batch tool, which allows you to process multiple input datasets in one operation. The output data will be saved to the ChristchurchData geodatabase. Any input shapefiles will be converted to geodatabase format automatically. Clipping features changes their shape. For example, a river that crosses the boundary of the Christchurch urban area will be split at the boundary. Only the segment that lies inside the boundary will be preserved. As mentioned earlier, you want your new data to be in the New Zealand Transverse Mercator coordinate system. Before you run the Clip tool, you'll make a tool environment setting that projects the input datasets as needed to this coordinate system. Make the map view active. In the Contents pane, right-click the Urban Area layer, point to Selection, and click Make this the only selectable layer . On the ribbon, on the Map tab, in the Selection group, click the Select tool . On the map, click the Christchurch urban area feature to select it. When you run the Clip tool, you'll specify the Urban Area layer as the clip layer. The tool will use the selected feature as the clip extent. In the Geoprocessing pane, in the search box, type clip. In the search results, Clip (Analysis Tools) is the first result listed. In the search results, right-click the Clip tool and click Batch. The Batch Clip tool opens. 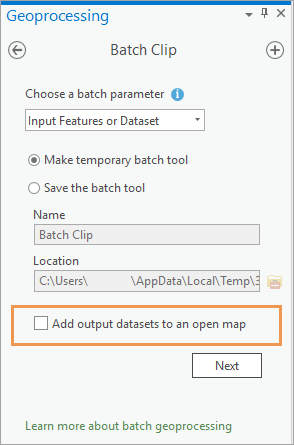 A batch tool is a temporary tool (that can be saved) that allows you to process multiple input datasets or other parameters. Most geoprocessing tools can be run as batch tools. Under Choose a batch parameter, confirm that Input Features is selected. Uncheck the Add output datasets to an open map box. You'll add the output datasets to a new map instead. On the Batch Clip tool, next to Batch Input Features, click the Add Many button . At the bottom of the drop-down list, click the Toggle All Checkboxes button . All the layers in the map are selected. However, you don't want to clip all of them. The boundary layers should keep their territorial integrity, so you'll process them separately. Notice that the Urban Area layer is included with the input features to be clipped. That's fine; it means that the layer will be clipped to its own selected feature. At the bottom of the drop-down list, click Add. Under Clip Features, click the drop-down arrow and click Urban Area. In the Output Feature Class box, delete the prefix Clip_OutFeatureClass_ from the output feature class name and leave the %Name% variable. Do not delete the entire path to the output geodatabase. The regenerated path may not go to the right geodatabase. 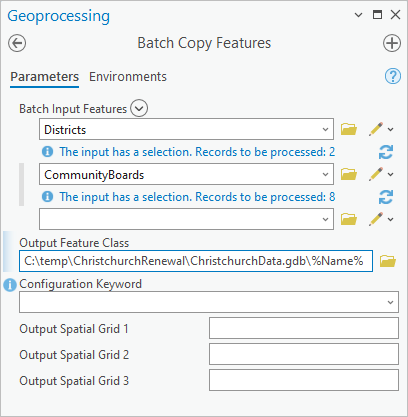 The output feature class path goes to the ChristchurchData geodatabase. The %Name% variable assigns the same input layer name to the output dataset. Because you're saving the output data to a different location than the input data, you don't need a file name prefix (such as Clip_OutFeatureClass_) to prevent naming conflicts. 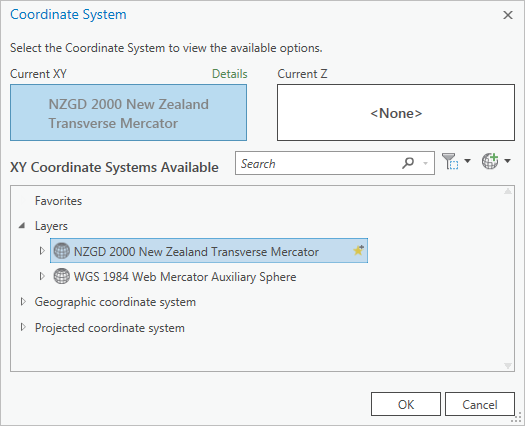 Although map layers in different coordinate systems are aligned spatially through on-the-fly projection, you want your output data to be created in the standard NZGD 2000 New Zealand Transverse Mercator system. You'll make an environment setting to project the input datasets into this system as needed. Geoprocessing environment settings are parameters that are not built into a tool but are applied to the output data when the tool runs. In this case, the environment setting saves you from running the Project tool separately on datasets that are in the Web Mercator coordinate system. 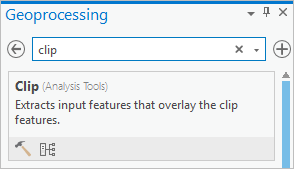 At the top of the Batch Clip tool, click the Environments tab. Next to Output Coordinate System, click the Select coordinate system button . On the Coordinate System dialog box, under XY Coordinate Systems Available, expand Layers. The two coordinate systems used by layers in the map are listed. 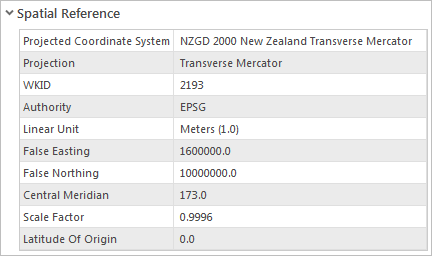 Click NZGD 2000 New Zealand Transverse Mercator to select it. Input datasets in the Web Mercator coordinate system, such as PlanArea, will be projected to New Zealand Transverse Mercator when they are output. In the Geoprocessing pane, click Run . The process takes some time because several datasets are being processed in multiple ways. When the tool finishes, a message appears at the bottom of the pane. You'll examine the new datasets in the ChristchurchData geodatabase. In the Contents pane, expand Databases and click ChristchurchData.gdb. In the lower right corner of the catalog view, click the Column button to display items as a list. There are nine feature classes in the geodatabase. Click the PlanArea feature class to select it. Open its feature class properties and check the spatial reference. The dataset is projected to the New Zealand Transverse Mercator coordinate system. You'll explore the data in a new map. Click the AvonRiver feature class to select it. Press Shift and click Urban_Area to select all the feature classes. Right-click any selected feature class and click Add To New > Map . A new map view named Map2 opens. Make sure the new map, Map2, is the active view. In the Contents pane, move the Urban_Area layer to a position just above the Topographic basemap layer. Zoom out on the map to confirm that all the layers are clipped to the extent of the Christchurch urban area. You no longer need to work with the first map. Make the Map1 view active. Click the Close button on its view tab. Map2 should now be the active view. The closed map is still available. It can be reopened from the Maps item in the Contents or Catalog pane. When you ran the Clip tool, you didn't process the boundary layers because you wanted to preserve their territorial integrity. However, the boundary layers cover the entire Canterbury region, a much larger area than you need. You'll make a spatial selection of the features in the CommunityBoards and Districts layers that have area in common with the Christchurch urban area. You'll copy the selected features to the ChristchurchData geodatabase without clipping them. You'll leave out the Region layer. It contains a single feature representing the Canterbury region and is too general for your needs. On the ribbon, click the Map tab if necessary. In the Selection group, click Select By Location . The Select Layer By Location tool opens. The Input Features parameter is used to specify the features you want to select. You want to select features from the CommunityBoards and Districts layers. These layers aren't in the map, so you need to browse to the datasets. The Input Features parameter shows the Urban_Area layer because this layer is selected in the Contents pane. It will be replaced when you browse to the other datasets. In the Input Features drop-down list, next to the first box, click the Browse button . The Input Features browser opens to the databases associated with the project. You need to browse to the source data in the Manage_Data folder. In the Input Features browser, under Project, click Folders. Browse to Manage_Data > Boundaries.gdb. Press the Ctrl key and click CommunityBoards and Districts to select both feature classes. (Don't select Region.) Click OK. In the Select Layer By Location tool, the two datasets are added to the input features list. Confirm that Relationship is set to Intersect. Under Selecting Features, click the drop-down arrow and click Urban_Area. The Select Layer By Location tool makes selections on map layers. Since the CommunityBoards and Districts datasets aren't represented by map layers, the tool will create layers, add them to the map, and select the appropriate features. When the tool finishes, two layers, Districts_Layer and CommunityBoards_Layer, are added to the map. In the lower right corner of the map view, you can see that 10 features are selected altogether. In the Geoprocessing pane, hover over View Details on the completion message at the bottom of the pane. A pop-up window shows the tool parameters and messages. The Count parameter tells you that 8 features are selected in the first output layer (CommunityBoards_Layer) and 2 features are selected in the second layer (Districts_Layer). To see the selected records, you could open the layer attribute tables, but it's not necessary. 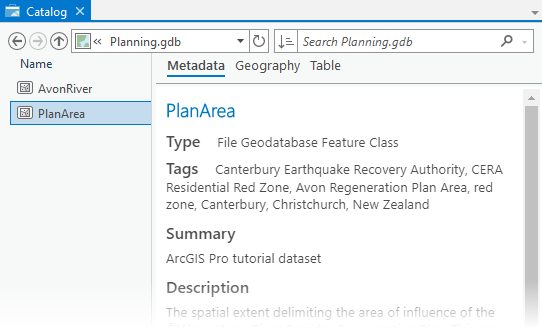 You'll proceed to copy the selected features to new feature classes in the ChristchurchData geodatabase. You'll run the Copy Features tool as a batch tool. Because the output datasets will use the names of the input layers, you'll rename the layers before you run the tool. In the Contents pane, change the name Districts_Layer to Districts. Change the name CommunityBoards_Layer to CommunityBoards. Click the layer in the Contents pane to select it. Click it again to make its name editable. Press Enter to commit the change. At the top of the Geoprocessing pane, click the Back button . In the search box, type copy features. In the search results, the Copy Features tool is the first result listed. In the search results, right-click the Copy Features tool and click Batch. The Batch Copy Features tool opens. Under Choose a batch parameter, confirm that Input Features is selected and click Next. In this case, the output datasets will be added to the open map. Under Batch Input Features, click the drop-down arrow (not the Add Many button) and click Districts. In the next empty input features box, click the drop-down arrow and click CommunityBoards. In the Output Feature Class parameter, delete the prefix CopyFeatures_OutFeatureClass_ and leave the variable %Name%. You don't need to make an environment setting for this tool because both input feature classes are in the NZGD 2000 Transverse Mercator coordinate system. In the Contents pane, turn off the CommunityBoards and Districts layers. This will reduce confusion when new layers with the same names are added to the map. When the tool finishes, the new layers are added to the map. You no longer need the original layers with the selected features. In the Contents pane, right-click the input Districts layer (the one that is turned off) and click Remove . In the same way, remove the input CommunityBoards layer (the one that is turned off). If you make a mistake, click the Undo button on the Quick Access Toolbar to undo your most recent action. In the Contents pane, move the Districts layer to a position just above the Topographic basemap layer. Move the CommunityBoards layer above the Districts layer. Right-click the Districts layer and click Zoom To Layer . Both layers extend beyond the Christchurch urban area because they are not clipped. However, only the features that intersect the urban area are included. The ChristchurchData geodatabase now includes the new CommunityBoards and Districts feature classes. 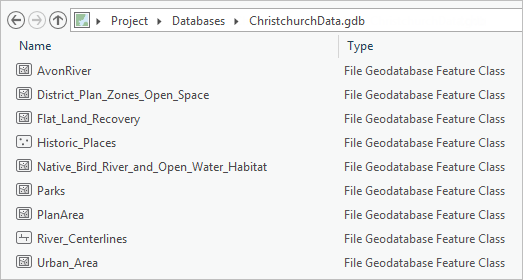 The metadata from your input datasets in the Manage_Data folder was copied to the new datasets in the ChristchurchData geodatabase. You'll review the metadata to correct spelling errors and update the item descriptions. You'll also add thumbnail images. In the catalog view, click the Native_Bird_River_and_Open_Water_Habitat feature class. Right-click the selected feature class and click Edit Metadata . A metadata view opens. Wavy red lines appear under several words. These include spelling errors, technical terms, and unusual place names. If you don't see the wavy red underlines, you need to enable spell-check. On the ribbon, click the Project tab and click Options. On the Options dialog box menu, under Application, click Proofing. Check the Enable spell checking box and click OK. Click the Back button on the settings page to return to the metadata view. Scroll through the metadata view. The Description field contains two adjacent spelling mistakes. Right-click the first mistake (acommpany) and click the suggested replacement accompany. The mistake is corrected and the red underline is removed. In the same way, correct the spelling mistake Emvironment to Environment. You can right-click a word and click Ignore All to remove underlines when an unrecognized word is spelled correctly. Alternatively, you can add the word to your custom dictionary and it won't be marked as a spelling error in other contexts. For more information, see Proofing options. At the bottom of the Description field, a note describes changes that have been made to the original source data. You'll add another note. In the Description field, click at the end of the text and press Enter to add a second bullet point. Type or copy and paste the following sentence: The data was converted to geodatabase format and clipped to the Christchurch urban area. On the ribbon, on the Metadata tab, in the Manage Metadata group, click Save. In the upper right corner of the catalog view, click the Show/Hide Details panel button to show the details panel. In the details panel, click the Metadata tab if necessary. There are no spelling mistakes in the description. The note you added appears at the bottom of the description. The data is previewed against a light gray basemap. On the ribbon, under Catalog View, click the Preview tab. In the Preview group, click Basemap and click Oceans. The basemap changes in the geography preview. In the Preview group, click Create Thumbnail . In the details panel, click the Metadata tab. You need to refresh the metadata to see the new thumbnail. Click a different dataset in the catalog view and click Native_Bird_River_and_Open_Water_Habitat again. The metadata displays with the new thumbnail image. Optionally edit the item descriptions and create thumbnail images for some other datasets. All the datasets have item descriptions except the Urban_Area feature class, which was derived from a Living Atlas layer. Optionally, you can import this item description. On the ribbon, on the Catalog tab, in the Metadata group, click Import . On the Import Metadata dialog box, click the Browse button . 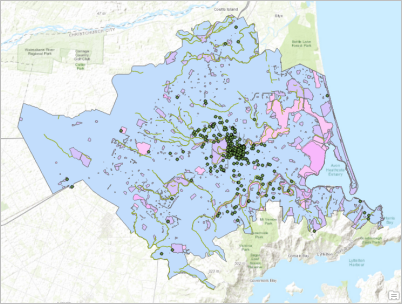 Browse to Portal > Living Atlas and search for NZ Urban Rural Indicator boundaries 2018 - generalised. Select the layer and click OK. Confirm that the layer URL is added to the Import Metadata dialog box. Click OK to import the metadata. As you have seen in your working maps, default layer symbology isn't always ideal. You haven't been concerned about the appearance of your maps, so you probably haven't changed any symbols. It's not your responsibility to make cartographic decisions about the Christchurch data, but it may be useful to create some layer files as a starting point for others to visualize the data. A layer file saves the properties of a layer, such as its name and symbology, to a file on your computer. When the layer file is added to a map, these properties are applied to the layer automatically. 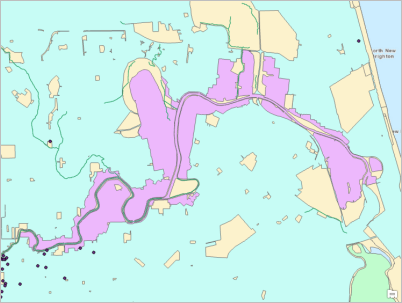 As with any map layer, a layer file needs to reference a source dataset in order to display. In the Contents pane, right-click the Historic_Places layer and click Zoom To Layer . In the Contents pane, click the symbol under the Historic_Places layer name. The Symbology pane appears and displays options for formatting point symbols. At the top of the Symbology pane, click the Gallery tab, if necessary. In the search box, type pin and press Enter. 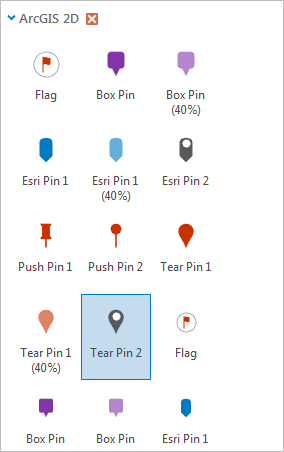 Under ArcGIS 2D, click the Tear Pin 2 symbol to select it. The symbol is changed in the Contents pane and on the map. In the Symbology pane, click the Properties tab. Under Appearance, change Size to 12 pt and click Apply. In the Contents pane, right-click the Historic_Places layer name and click Sharing > Save As Layer File . The Save Layer(s) As LYRX File browser opens to the ChristchurchRenewal home folder. In the Name box, leave the default name Historic_Places.lyrx. Click Save. Optionally, create layer files for some other layers. For example, to symbolize the Urban_Area layer with a hollow fill symbol, search for outline in the symbol gallery. To find suitable symbols for the Parks and AvonRiver layers, search for park and water in the symbol gallery. While the map is open, this is a good time to reset the Explore tool setting that you changed earlier in the tutorial. On the ribbon, on the Map tab, in the Navigate group, click the Explore drop-down arrow and click Topmost Layer. Make the catalog view active. In the Contents pane, under Folders, click the ChristchurchRenewal folder to see the layer file. 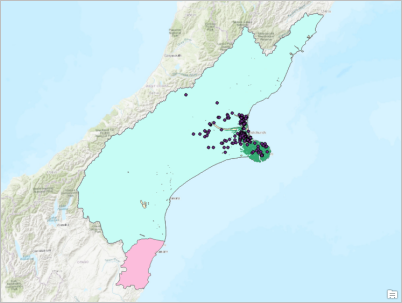 The ChristchurchData geodatabase is complete. The ChristchurchRenewal folder contains the geodatabase and your layer file (or files). The folder can now be shared on a network. Alternatively, it can be uploaded to ArcGIS Online in a compressed format or shared through email and other applications. You can also share individual datasets as web layers to ArcGIS Online. To learn about this workflow, see the Share a web map tutorial. During this tutorial, no project file was saved to your computer (unless you chose to save the project on your own). 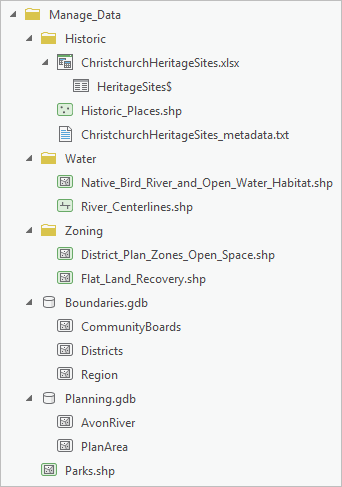 The ChristchurchRenewal folder and ChristchurchData geodatabase are saved independently of any ArcGIS Pro project. The working maps you made were useful for evaluating data and choosing input layers for tools, but you don't need to keep them. If you're going on to the optional section, leave ArcGIS Pro open. Otherwise, on the ribbon, click the Project tab. In the list on the left, click Exit. Click No on the prompt to save changes. Your data includes a feature class named Historic_Places. As you saw when you first browsed the contents of the Manage_Data folder, there is also an Excel file called ChristchurchHeritageSites. This file contains records for two locations that aren't included in the Historic_Places dataset. You can add features from one dataset to another, a process called loading data, with the Append geoprocessing tool. The two heritage sites that you want to add are rows in an Excel sheet and must be converted to point features before you can load the data. The converted point features are intermediate data. After you load them into the Historic_Places feature class, you won't need to keep them as a separate dataset. For this reason, you will not save these features to an output feature class. Instead, you'll write them to a temporary memory workspace and load them into the Historic_Places dataset from this workspace. 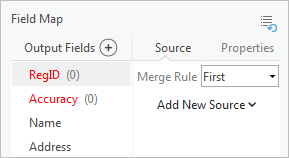 When you exit ArcGIS Pro, the memory workspace will be cleared. If necessary, make the catalog view active. 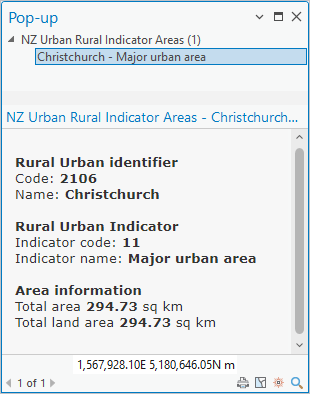 In the Contents pane, under Databases, click the ChristchurchData geodatabase. In the catalog view, click the Historic_Places feature class. Preview its metadata, geography, and table. The feature class contains 322 points of historic interest in the Christchurch urban area. The table attributes include Name and Address fields. The RegID field stores a numeric identifier of up to four digits. 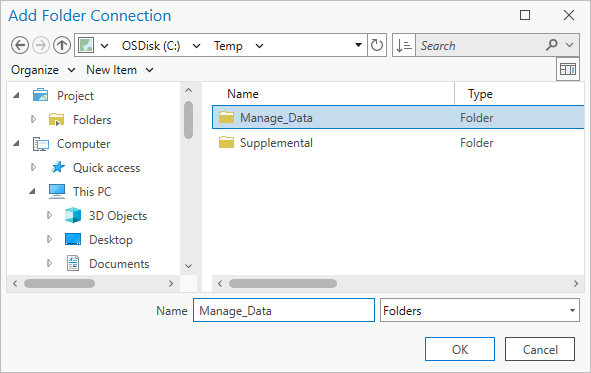 In the Contents pane, under Folders, expand the Manage_Data folder if necessary. Expand the Historic folder under it and click ChristchurchHeritageSites.xlsx to select it. In the catalog view, click the HeritageSites$ sheet and preview its table. The table has X and Y columns that store longitude and latitude values in decimal degrees. These coordinates allow you to convert the locations to spatial data. In addition, there are Name and Address columns. There are also several other columns, including one named RegisterNumber. 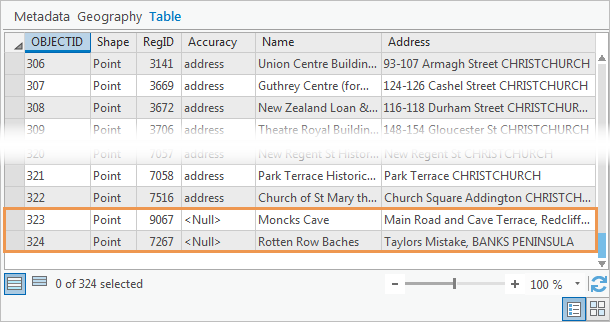 This column stores numeric identifiers, just like the RegID field in the Historic_Places table. You'll add the Excel sheet as a table to the map and convert the table to point features. This will allow you to confirm that the heritage sites don't already exist in the Historic_Places layer. In the catalog view, right-click HeritageSites$ and click Add To Map2. At the bottom of the Contents pane, the HeritageSites$ table is listed under Standalone Tables. 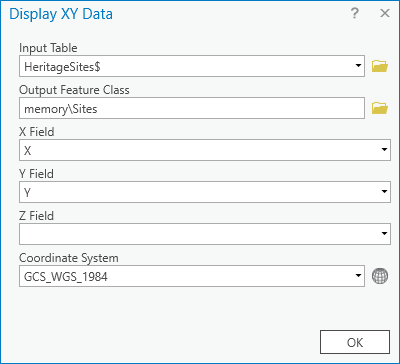 Right-click the HeritageSites$ table and click Display XY Data . In the Geoprocessing pane, the XY Table To Point tool opens. The Input Table parameter defaults correctly to HeritageSites$. The X Field and Y Field parameters default correctly to the X and Y fields in the table. The coordinate system defaults to GCS_WGS_1984. Most latitude-longitude values are stored in this system, so it's safe to assume this setting is correct. In the Output Feature Class text box, delete the entire path. In the empty box, type memory\Sites. The path name memory specifies that the output will be written to the memory workspace rather than to a geodatabase. The name Sites can be any name that you choose. When the tool finishes, a layer named Sites is added to the top of the Contents pane. In the Contents pane, right-click the Sites layer and click Zoom To Layer . There are no features from the Historic_Places layer at the locations of the two sites. This confirms that you can proceed to load the data. Make the catalog view active. In the Contents pane, under Databases, click ChristchurchData.gdb. In the catalog view, click Historic_Places. 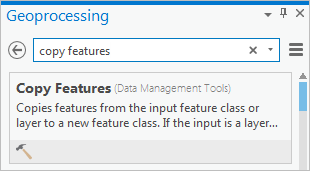 Right-click the selected feature class and click Load Data. 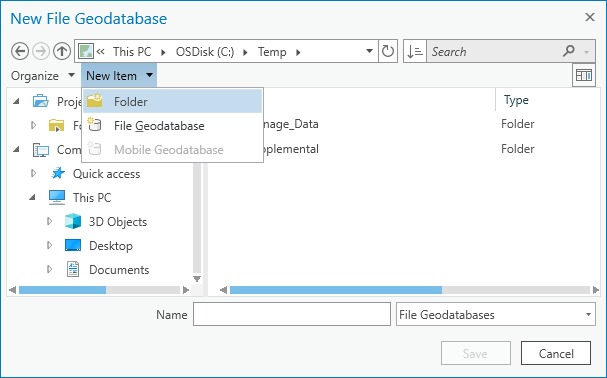 The Append tool opens in the Geoprocessing pane. The Target Dataset is automatically set to Historic_Places. This is the dataset where features will be loaded. Click the Input Datasets drop-down arrow and click Sites. When you append features from one dataset to another, their attributes must be compatible. If the input and target datasets have exactly the same fields, you can use the default Schema Type setting Input schema must match target schema. However, in this case, many of the fields don't match, so you need to change the setting. Click the Schema Type drop-down arrow and click Use the Field Map to reconcile schema differences. You can match fields manually when the field names are different but the attribute values are of the same kind. In the Field Map area of the tool, the output fields represent fields in the target dataset. The RegID and Accuracy fields are red because they don't have matching field names in the input dataset. The Name and Address fields are black because they do have matching field names. In the list of output fields, confirm that RegID is selected (highlighted in gray). Click Add New Source. In the drop-down list of fields, check the box for the RegisterNumber field and click Add Selected. In the Output Fields list, RegID turns black because you matched it manually. When the data is loaded, values from the RegisterNumber field in the input table will be appended to the RegID field of the target table. Fields in the input table that match fields in the target table will have their attribute values appended to the corresponding fields in the target table. Unmatched fields in the input table will not be added to the target table. Unmatched fields in the target table will have <null> values for appended records. The input dataset is not in the New Zealand Transverse Mercator coordinate system; it is in the WGS_1984 geographic coordinate system. However, when the features are loaded, they will be projected automatically into the coordinate system of the Historic_Places feature class. When the tool finishes, in the catalog view, click Historic_Places. In the details panel, preview the table and scroll to the bottom. Two records have been added to the table: one for a site called Moncks Cave and one for a site called Rotten Row Baches. The new records have values in the Name, Address, and RegID fields. The Accuracy field has <Null> values. The new features have been added to the Historic_Places layer in the correct locations. On the ribbon, click the Project tab. In the list on the left, click Exit. Click No on the prompt to save changes. When your ArcGIS Pro session ends, the memory workspace is cleared and the intermediate Sites data is deleted.